Earl's AN to Metric Adapter Fittings help easily adapt AN lines to metric threaded components. 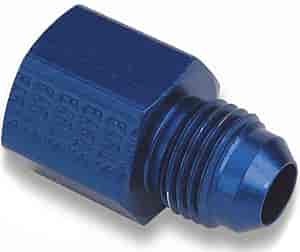 These adapter fittings are precision machined from 2024 aluminum or steel and are offered in a variety of anodized colors or electroless nickel plating for great looks and lasting durability. All fittings are sold individually unless specified otherwise. 9894DBJ - Earl's AN to Metric Thread Adapter Fittings is rated 3.0 out of 5 by 1. Rated 3 out of 5 by richsix from Earl's AN to Metric Thread Adapter Fitting Bought 2, 1 had burrs left inside from the machining process at the opening of the flare surface. I took the burr off which left an edge of material without the coating. I expect that to come back at me down the road but I wanted to save myself another week or two of waiting for an exchange so I went with it. Both fittings worked fine.